Today, when you order "The MINI Penguin Cups", you'll instantly be emailed a Penguin Magic gift certificate. You can spend it on anything you like at Penguin, just like cash. Just complete your order as normal, and within seconds you'll get an email with your gift certificate. For street work, table-hopping, close-up and parlor shows The Penguin Cups are ideal. But, for all those times when you want to toss some tricks into your pocket and take on the world, The Penguin Cups are just TOO BIG. There's no way to comfortably fit them into your pocket without making your pants look like a partially inflated life raft. The MINI Penguin Cups to the rescue! We're proud to introduce The MINI Penguin Cups. The MINI Penguin Cups are the perfect companion to the original Penguin Cups. They're every bit as well designed and beautiful as the full-size cups, AND they'll fit into your pocket comfortably with room to spare. 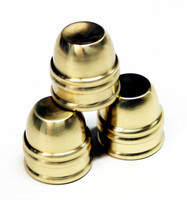 3 solid brass cups. Dimensions: 2.7 oz. (each), height 1.25", mouth 1.25" in diameter. 4 rubber peas. Great however the balls it comes with were a bit too small in my opinion. The brass cups are well made and will last you a life time. This is great for portability if you travel a lot or don't have enough space for the huge cups. The mini cups rock the house. Bring your A-game with these mongooses! I think these are a great idea. I love the fact that I can carry these where ever I go. This set is actually heavier than the aluminum ones I had before. Some of the negatives about this set is that it can be harder to vanish the small black pees, however this builds skill and precision. Over all, I think you should buy these cups. Recommended, if you have experience with cups. They do not privide you with an instructional video. That's why i gave it 4 stars. Other than that, I like the cups, they have a good feel to it, and they make a good collectors item. They'll last a long time. I couldn't afford the penguin cups so I bought these. Great. I also got two sets of balls to go with em! BUY THEM NOWWWW! Let's just say that these cups are really cool. They are a close up workers dream and the addition of the chop cup is very nice. They are not however a complete substitute for the regular sized pro cups. Many effects and routines are possible with these cups, but there are some that you can not do that you can do with the full sized cups. I suggest investing in a full sized set and then move to these once you have the basic moves mastered on the full sized. Smaller is sometimes better, but not always as effective. Overall amazing cups and if you already own a full sized set then BUY THESE CUPS NOW!!! These cups were awseome! They are way cheaper and work better than the other penguin cups. If you're not a hobo add to cart now! These are real nice, not as expensive as the original, becasue it's smaller. I like them a lot, because they can be easily trasported. They are exactly the same as the big ones, just smaller, so if you aren't going to buy them because you think they might be cheap, you're wrong, so get them now.